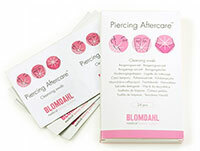 Box of 24 Blomdahl piercing aftercare cleansing swabs are suitable for use with Blomdahl medical plastic and titanium earrings, nose studs and belly bars. The swabs can be used to clean the jewellery and piercing when running water is not available. Ingredients: Natrii chloridum, aqua. Gamma sterilized. Please note: This product can only be delivered to UK addresses. These cleaning wipes are fantastic. They are very easy to open and just the right size to carry around in a bag. They clean my ear well and I have had no allergic skin issues.